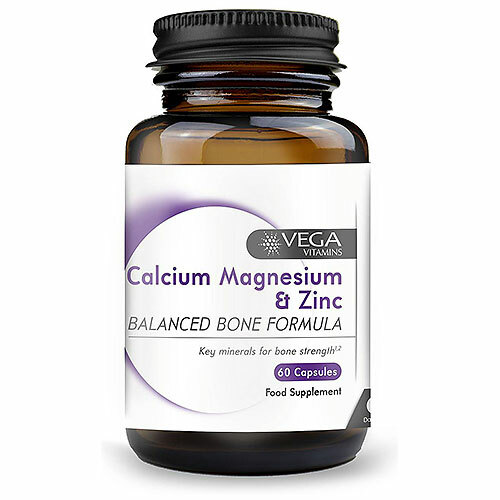 Calcium and magnesium are the major components of bone matter and are essential minerals to maintain healthy and strong bone structure. Magnesium also plays a vital role in the proper absorption and distribution of calcium. Calcium, magnesium and zinc also play an important role in maintaining a healthy nervous and muscular function. Elderly people, post-menopausal women, growing children, vegetarians and vegans may have an increased dietary requirement for bone building minerals. Calcium (Calcium Carbonate, Calcium Citrate), Magnesium (Magnesium Oxide, Magnesium Citrate), Microcrystalline Cellulose, Vegetable Capsule Shell (Hydroxypropyl Methylcellulose, Colours (Titanium Dioxide, Copper Chlorophyllin)), Zinc Citrate, Anti-caking Agent (Magnesium Stearate). As a food supplement for adults, take 1-2 capsules daily with food or as directed by a healthcare professional. Do not exceed recommended intake. Below are reviews of Vega Vitamins Calcium Magnesium & Zinc - 60 Capsules by bodykind customers. If you have tried this product we'd love to hear what you think so please leave a review.